USA Pentathlon is looking for high school and collegiate swimmers with a running background. 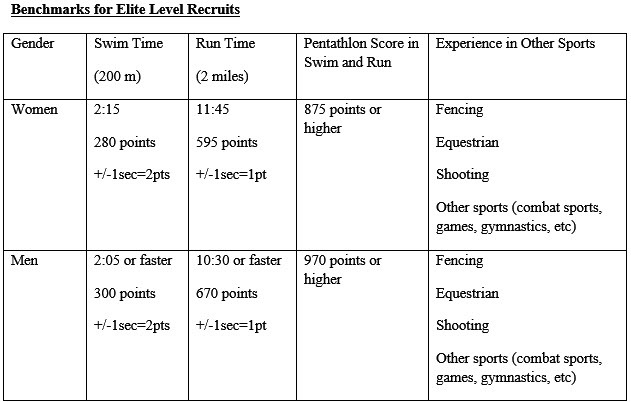 Benchmarks for elite level recruits are based on their pentathlon points in swimming and running times as well as experience in other sports (see benchmarks below). 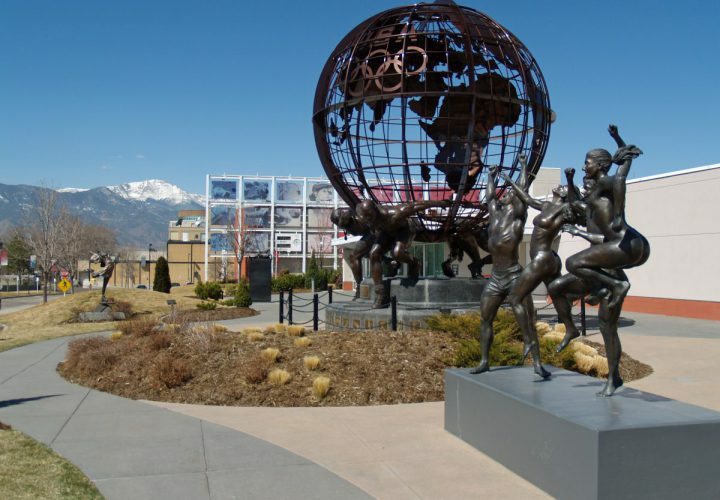 The goal is to recruit athletes who have enough swim+run points to qualify for USA Pentathlon training camps at the Olympic Training Center in Colorado Springs. The elite Junior/Senior level athlete recruitment program focuses on athletes who are in college or post-grads and have fast swimming and running times with talent for other Pentathlon events. These athletes are identified through many initiatives and are channeled to the elite-development level program across the country with the ultimate goal of progressing through domestic events to competing at the international senior competitions, such as World Cups, World Championships, 2023-2027 Pan American Games and 2024-2028 Olympic Games. Having a swimming background is important for elite level recruits. It is hard to improve swimming at age 16+ and reach above mentioned times with little or no swimming background, whereas running can still be developed at later ages. Any combination of swimming and running times (faster swimming and slower running or slower swimming and faster running) that scores 875 qualifies female athletes to attend the Olympic Development Camp at no charge. Any combination of swimming and running times (faster swimming and slower running or slower swimming and faster running) that scores 970 qualifies male athletes to attend the Olympic Development Camp at no charge. Athletes who have good swimming and running scores are invited to contact Dr. Genadijus Sokolovas at gsokolovas@gmail.com.